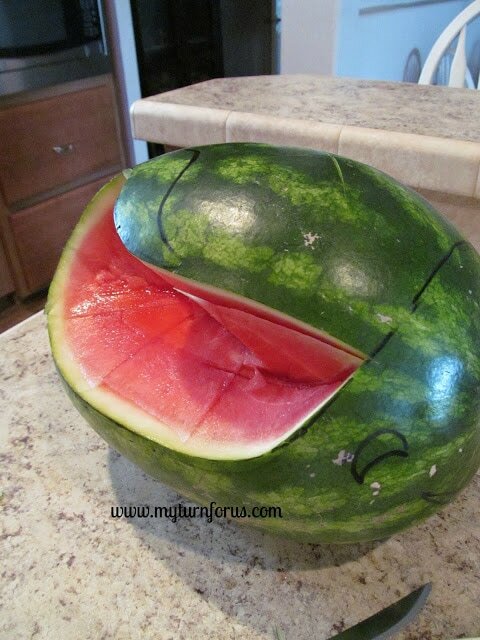 Have you ever trying any melon carving? We have been making carved watermelon decorations for years but this whale watermelon is our favorite. And it’s not that hard, we promise. 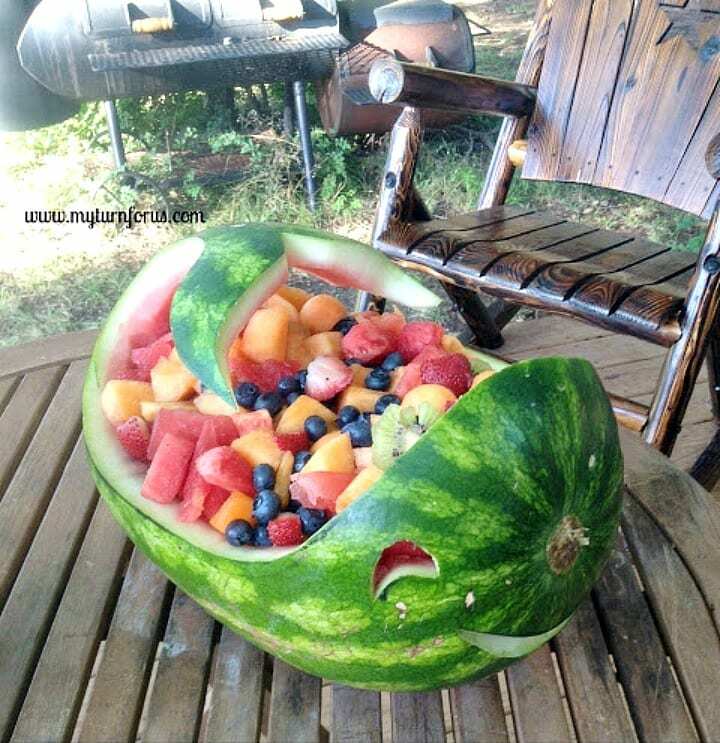 Throughout the years we have made several of these fun whale watermelons as part of our carving melons craze. In the fifth grade, my son’s class planned an “Under the Sea’ party after a session of studying the creatures and fishes that inhabit the ocean and the teacher asked we bring dishes following this theme. My eldest daughter carved a whale watermelon and it was the hit of the party. And of course, that it was filled with healthy fruit also made it a favorite of the moms. We made two of these carved melons for my mother’s 75th birthday party for the cutest tabletop watermelon decorations. 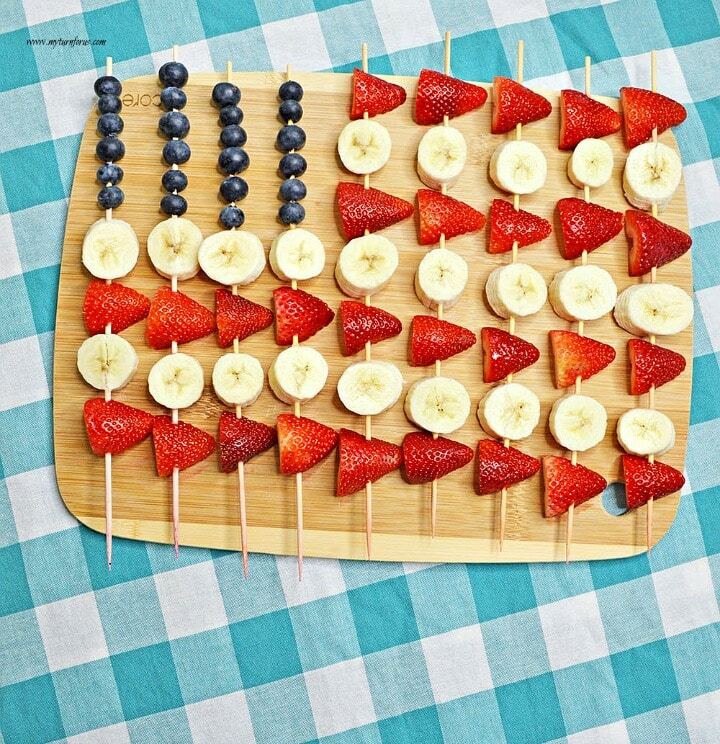 And just recently we carved one for our Fourth of July picnic celebration. 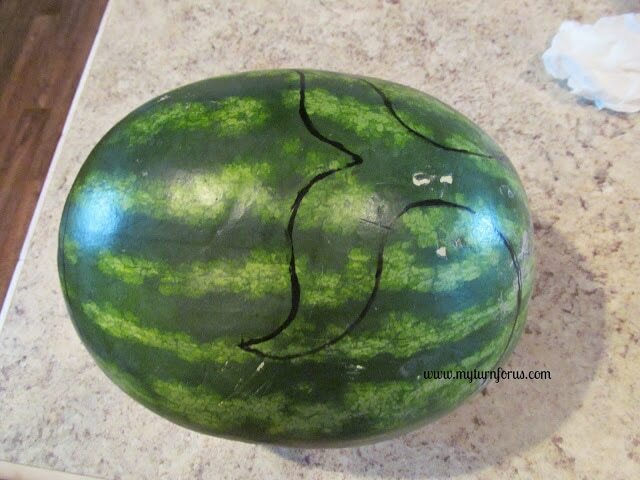 Carving melons is not really that hard, it just takes a little bit of patience and a couple of tricks. We will give you the tricks and I’m sure you have the patience. 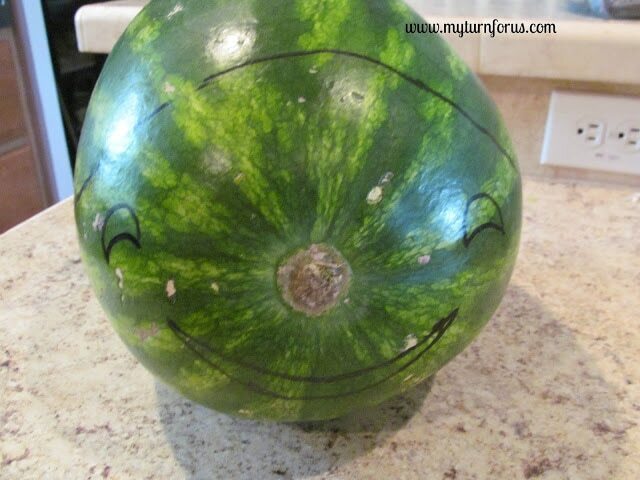 Place the watermelon on a flat surface, stem side toward you. The stem will be the nose. Using a “dry erase” marker draw the eyes, mouth and the top of the head. 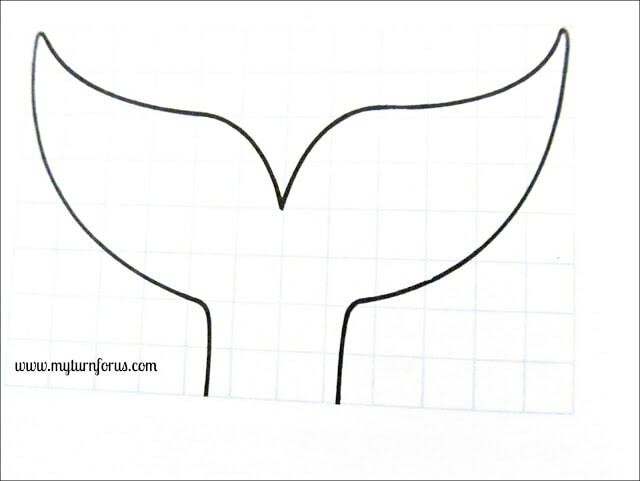 Make a pattern for the whales tail using the above graph or visually use it as a reference to draw the whale’s tale on the top of the watermelon. Melon carving is also easier using a very sharp knife and/or these watermelon cutting tools. 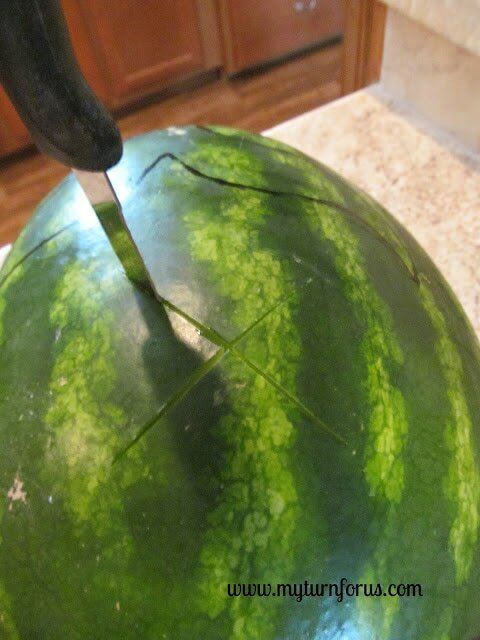 To relieve the pressure inside the watermelon and to prevent the outline from splitting as you cut, use a shape knife to cut an X through the top of the watermelon. To make the shell, cut along the outline for the opening and cut away the unwanted shell in pieces. Scoop out the watermelon fruit, leaving the shell about 1 inch thick. 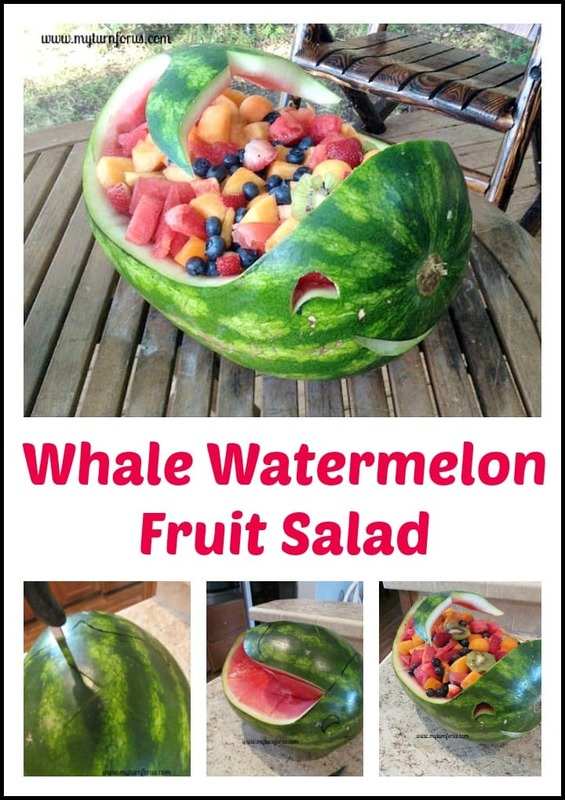 Reserve the watermelon fruit to add to the other fruit in the whale. Cut out the eyes completely. Cut out the mouth only halfway through the shell so the juices from the fruit will not run out. *Note: Prior to filling with fruit, the whale may be covered with plastic wrap and refrigerated overnight. 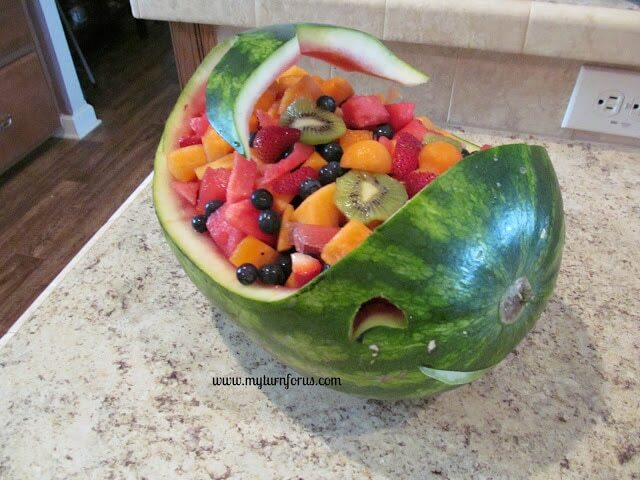 Before serving, fill the whale with cantaloupe, grapes, strawberries, blueberries, kiwi, and pieces of watermelon or any other fruit you would like. As an added convenience use Fruit Slicers and carvers to cut up the fruit for the watermelon. To add to your Watermelon theme you could add Watermelon plates and napkins to your table or you might like to try other melon carving projects in this Easy Watermelon Carving book. What a friendly whale ! 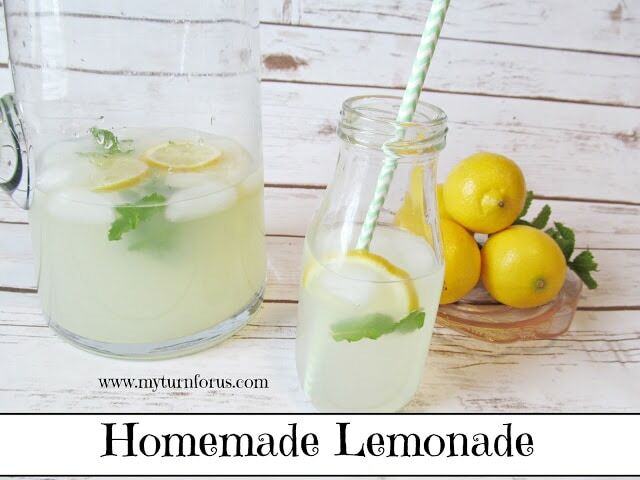 Love this idea, Evelyn !